Halfway through January and it’s just a few weeks to go until the UK release of OSIRIS. Last week I received a copy of the final version of the book – the marvellous folk at Del Rey UK have done me proud, it’s a beautiful production, embossed title and all. To celebrate the release, I’ll be reading/signing at Forbidden Planet on Friday 8 February with the brilliant Liesel Schwarz, whose steampunk novel A CONSPIRACY OF ALCHEMISTS is released on the same date. Do come along and say hello – we’d love to see you there! Forbidden Planet are delighted to bring you a double signing with two of this year’s most exciting new talents! Liesel Schwarz and E. J. Swift will be at the London Megastore, 179 Shaftesbury Avenue, WC2H 8JR, on Friday 8th February 2013. 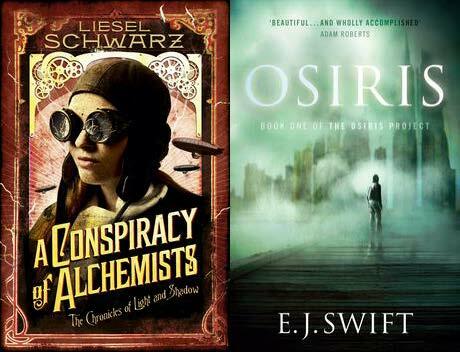 Liesel’s ‘Conspiracy of Alchemists’ brings us a Golden Age where spark reactors power the airways, and creatures of Light and Shadow walk openly – and a deadly game of Alchemists and Warlocks has begun. When an unusual cargo drags airship-pilot Elle Chance into the affairs of the mysterious Mr Marsh, she must confront her destiny and do everything in her power to stop the Alchemists from unleashing a magical apocalypse. In ‘Osiris’, E. J. Swift brings us Adelaide Rechnov, wealthy socialite and granddaughter of the Architect, who spends her spends time in pointless luxury, rebelling against her family. In the impoverished Western Quarter lives Vikram Bai, poor descendant of storm refugees and effectively quarantined from the wealthy elite. His people live with cold and starvation, but the coming brutal winter promises civil unrest, and a return to the riots of previous years. As tensions rise in the city, can Adelaide and Vikram bridge the divide at the heart of Osiris before conspiracies bring them to the edge of disaster? This entry was posted in Del Rey UK, Events, Osiris on January 14, 2013 by E J Swift.